So I have the itch to blog again… and what better time than now, when it’s time to hash out those lovely winter recipes that have been sitting around the kitchen for months on end? The last time I made buta no kakuni was last Christmas; impatience and a loose hand with the soy sauce led to a sad and salty affair with rough meat. This time, I was going to bring out the big guns. Cue this excellent recipe I came across from Chubby Hubby‘s blog, which in turn comes from Masaharu Morimoto’s ‘The New Art of Japanese Cooking’. When I first came across it, it looked impossibly complicated – with a very long cooking time and lots of waiting about, I was turned off of the idea. But I decided the effort would be worth it, and took the plunge. I didn’t take any photos during the process because (a) who said I was cooking this for purpose of blogging about it? (b) I wasn’t sure how successful it’d be. Well, here I am now, blogging about a very successful dish… and it has inspired me to blog more again! I did, as I’m prone to do, make a few alterations. One was using ordinary white short grain rice in the initial braising process instead of brown – I just couldn’t be bothered to buy a pack of brown rice (weirdly expensive in Japan Centre) and I couldn’t find any information on what the effect would be, except that it ‘tenderises’ the meat – not sure what the difference is between brown and white rice, though. For the first part, I’m guessing the rice keeps the pork tender by ‘insulating’ it as it braises, protecting it from too much direct heat? Brown rice probably doesn’t break down as much as white in that time, therefore ‘protecting’ the pork for longer? Err, Heston, give us a hand…? The initial braising process is 8 hours, but I cheated. I did it only for 4 – my pork belly was already sliced into strips when I bought them, so I figured it needed less time. I started at 8pm after work and couldn’t leave the oven on all night, either! Then it was left to rest, as Chubby Hubby did, in the oven overnight. 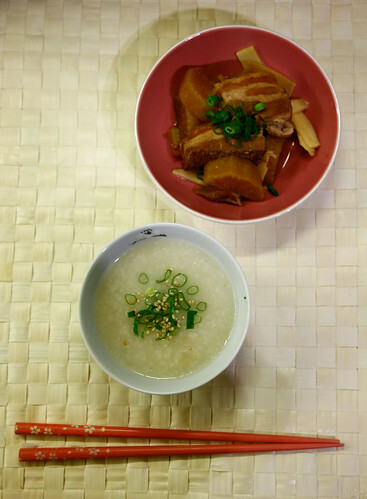 The next night, the pork was removed from the thick rice mixture and, instead of wastefully discarding the rice as suggested, I bunged it into my rice cooker, added some chicken stock and the soaked dried scallops and made the congee that way! The rice, afterall, had soaked up so much flavour from the pork during that initial cooking process so it would have been silly to throw all that away. 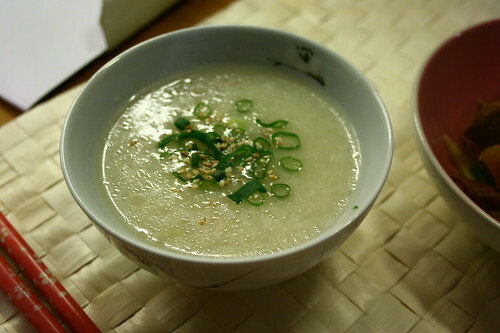 The resulting congee was so silky, and so full of porcine goodness and lovely dried scallop flavours. With some chopped spring onions and a sprinkle of sesame seeds, it was enough! 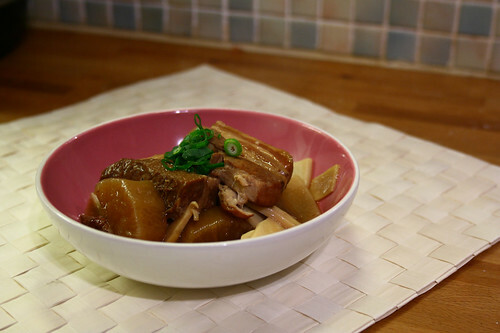 So then the pork went on to be braised again for several hours with a mixture of soy sauce, sake, sugar and water, along with bamboo shoots and chunky pieces of daikon (my own additions, because I love the way they soak up the flavours of anything it is braised with). Result! The pork was already falling apart after the first cooking process and by the second it was meltingly tender. Gorgeous. I’d recommend anyone to give this recipe a shot. It may sound daunting at first, but you really do just leave it to do its own thing most of the time. Set it aside for a weekend when you’re home, shying away from the cold. Oh, and I’m intending to do a few more posts that I’ve been meaning to do for ages. Yes, I am talking about Colombia! And I have also recently discovered an unfinished draft of a second Vienna post hidden in my dashboard. Oops. So, yeah. Stay tuned. The Chinese really like their kei’s. It’s almost like the Cantonese version of the Japanese attachment of ‘-san’, except there’s a greater sense of closeness and familiarity when tacking ‘kei’ onto the end of something. It’s casual and homely. Like snippets of a daydream, my recollections of my trip to Macau this August are hazy. But one look at the photos I took there and like some Pavlovian puppy, I start to salivate. How embarassing. Here are three of the best places I went to (though I only went to four, Solmar wasn’t really worth mentioning even though it claims to be the best, and the oldest, Portuguese restaurant in Macau). 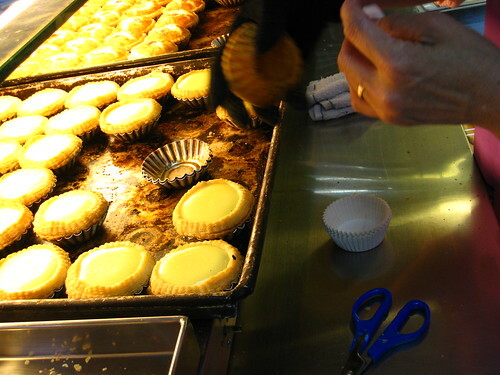 I’m not as informed within the Hong Kong foodie world as I’d like to be – so it was only this past week that I finally made a visit to Xǐ Yàn Sweets down in Wanchai’s Wing Fung Street. All credit goes to my mom, who is always reeling off names of restaurants that I should try out, for varying reasons! Note : the menu may be subjected to slight changes if the chefs believe that certain ingredients available for the particular day is not as satisfactory for serving. 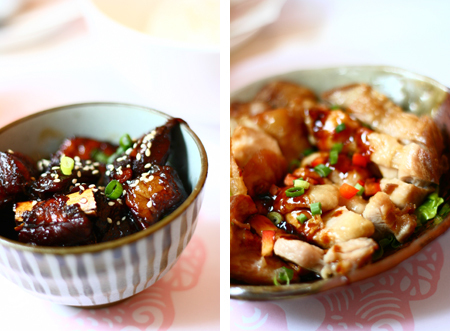 To find out more, check out a wonderfully written and comprehensive review of the original Xǐ Yàn over at Cha Xiu Bao! The name of the establishment, Xǐ Yàn (囍宴), is a nod to the traditional Chinese wedding banquet, but the dishes couldn’t fall further from the rigid, set styles of banquet fare, where there will be one chosen regional cuisine throughout the entire course progression. The marriage, if you excuse the pun, of many different regional Asian cuisines at Xǐ Yàn means that in one night you’ll be able to sample delectable dishes ranging from sweet Japanese tomatoes with sesame sauce (which my tomato-aversive mother declared as the best she had ever tasted) to coconut chicken soup. A peek at the sample menu from their website also reveals dishes such as foie gras somen, tofu ice cream, and scallop on glutinous rice with olive & black bean paste – showing a true fusion of some of Asia’s best cuisines, with a slight Western/European touch. 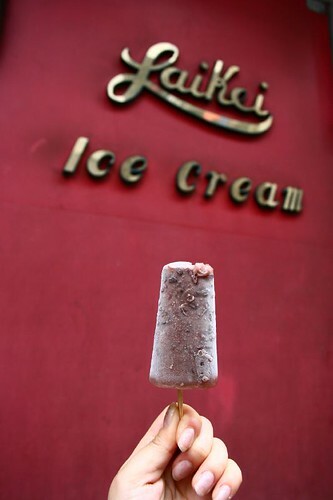 A freelance journalist and full-time gourmand, eating her way mostly through London and Hong Kong. Charmaine currently digs: the smell of coffee; adding ponzu to everything; bill granger; still eating natto with every meal; caressing her Nikon FM2n.